When both sections of synthetic turf are secure and the seam is perfectly in place, fold open both edges of the two sections to expose the subgrade. Place SGW seam tape down the center of the seam and secure with spikes, nails or staples. This will prevent the seam tape from rippling while placing the glue. Roofing Repair Tape is NOT! Made for synthetic turf seams. Many contractors are using this economical, fast roofing repair tape as a synthetic turf seaming tape. Roofing Repair Tape is not manufactured or tested as a Synthetic Turf seam tape. 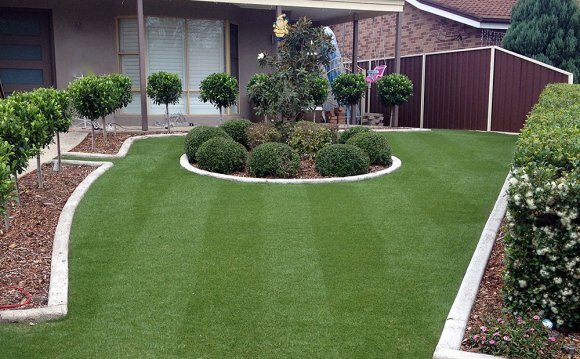 It does not have the ability to successfully cohere two sections of synthetic turf together. The pictures below show that the roofing repair tape only touches the exterior of the gauges and does not reach up and between the gauges to the backing. I personally have witnessed hundreds of seam failures that were seamed together with roofing repair tape. You can easily pull the seam from the tape months after the roofing tape has been placed. I recommend to never use this as synthetic turf seam tape. Superseam Pro Adhesive is a single component Urethane adhesive. It is the professional’s choice of synthetic turf glue adhesive. Its adhesion strength has been tested against its competition and outperformed them all. In fact it averaged 200% stronger then the leading competitor. Superseam Pro Adhesive has excellent shear and elongation properties, along with its ability to withstand harshest weather conditions with great longevity. Superseam Pro Adhesive can be used indoors or outdoors with proper ventilation. Superseam Pro Adhesive has many uses in the synthetic turf and carpet industry including “Glue Down” on exterior surfaces as in concrete, pavers or clean asphalt. • Superseam Pro Adhesives are manufactured in the U.S.A with no pigments. Pigmented adhesives can be a concern for staining surfaces that are other than its use. • No foaming through seams at high temperatures. • Much thicker viscosity than other leading adhesives on the market today. • User friendly and workable cure times. • Great adhesion and superior strength in heavy traffic areas. • Superseam Pro Adhesive can be used in Synthetic Turf Glue Box applications. • Superseam Pro Adhesive coverage rate varies upon substrates surface condition. • When seaming synthetic turf 12” Seaming tape the coverage rate is approximately 50 linear feet per gallon (12” wide spread at 1/8”using the Superseam Trowel). Thicker applications are up to the professional. Superseam Pro has been tested and maintained its strength under water during its curing process to ensure its stability and bonding strength. This test ensures its longevity during harsh wet climates. Superseam Pro withstands freezing temperatures and remains strong and flexible in addition to preventing seam rupture, even during the hottest days.